Alyson Miller was one of NCSE’s Grand Canyon Teacher Scholarship winners. She teaches biology, zoology, physical science, and plant science at Nashua High School North, in New Hampshire. Teachers can apply for a scholarship on next year's trip, and you can donate to the scholarship fund or sign up for the trip now. There it was, the greenish crystals glittering in a large hunk of million-year old lava next to a trail. 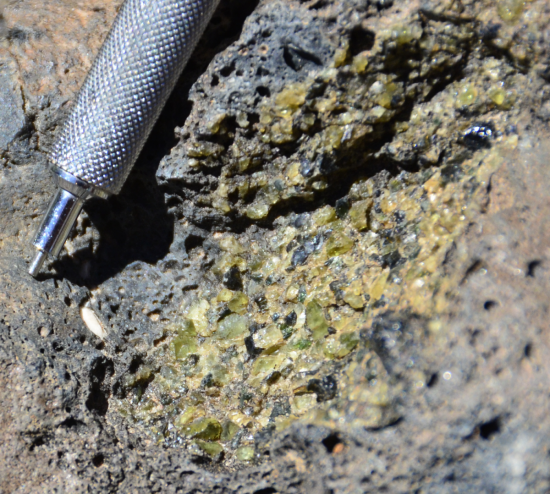 Two geologists inspected it, and when I heard one of them say that the olivine-rich peridotite had probably come all the way from the Earth’s mantle, I had to walk away. 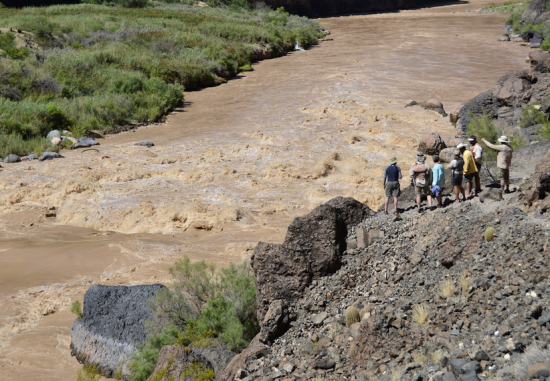 As one of the winners of NCSE’s new Grand Canyon Teacher Scholarships—which provide all-expenses-paid rafting trips down Grand Canyon—I had spent a week reveling in the spectacular evidence of deep time revealed by the Colorado River as it cut through layers of the Earth’s crust. As I floated past rocks as old as 1.8 billion years, I was smugly reassured that life was resilient. I was looking forward to bringing that message back to my high school students. When I saw that olivine, however, I suddenly had second thoughts. The olivine-bearing lava was near the scouting point for Lava Falls, the largest navigable rapid in North America. From this perch, boatmen study the thundering, swirling maelstrom of whitewater to glean the best path through it. I knew that I should have stuck my head into the geologists’ conversation, but I skidded around them and climbed onto the raft, preferring to grab the straps of bucking pontoons and face the rapids rather than think about that rock. As far as I was concerned, that olivine was a terrifying reminder that we are all riding helpless aboard a shard of Earth's crust. That shard floats on the furiously hot conveyor belt of the mantle as it builds mountains, erupts, and rips apart landmasses—and the continuity of life is not a sure thing. Facing the abrupt thirteen-foot drop of Lava Falls while avoiding a gauntlet of submerged boulders and the giant “cheese grater” rock that would easily pierce an out-of-control rubber raft was preferable to thinking about that. Downstream from the rapids, plucky little cacti thrived on top of more olivine-containing lava flows. Perhaps my first impression was correct: life goes on, and maybe the tumult going on down in the mantle isn’t always a bad thing. Although the mantle constantly changes our planet, that’s what prevents the land from eroding into nothingness, as the Mesozoic layers of Grand Canyon have already done. Frightening as it was to me, the changing environments provided opportunities for new life forms to flourish. Some of the mechanics that created drastic environmental changes, such as shifting tectonic plates, subduction, uplifting, erosion, and the rise and fall of ancient mountains and seas, were even beginning to make sense. 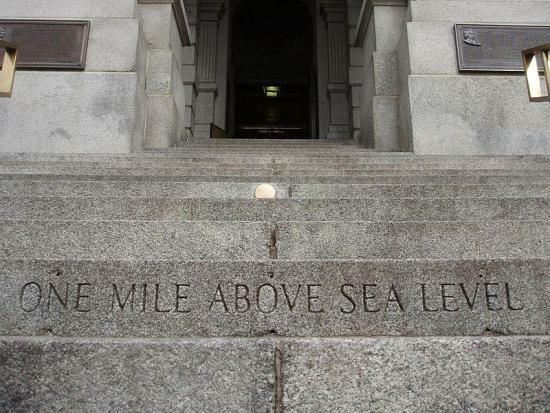 Several years ago, my brother and I stood in front of a plaque in Denver that proclaimed our location to be one mile high. I asked him how such a flat city had risen that much. He shrugged his shoulders, saying, “It just is.” Now that I could appreciate all of the rock layers stacked below the “Mile High City,” I had my answer. It had been lifted like a clod of dirt while the shovel of the Pacific Ocean crust slid beneath it. It was those rocks that were hidden under Denver but exposed in Grand Canyon that finally calmed my olivine phobia. Some of them contained fossils, and touching them elicited an unexpected visceral response; I was no longer merely seeing them, I was feeling a kinship with the very roots of my DNA. 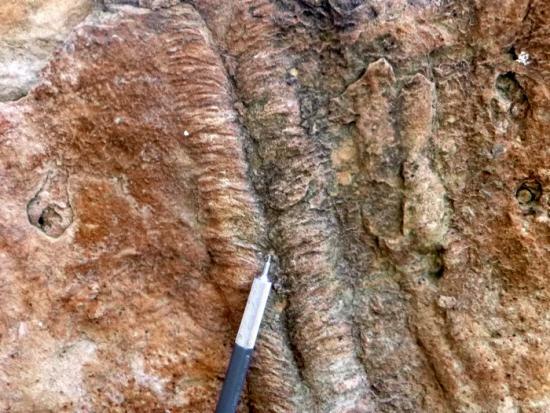 One slab of the most recent of the Paleozoic Era rocks had the fossilized footprints of a reptile that had wandered across a sand dune not long before the Great Permian Extinction wiped out 90% of all species on the planet. The footsteps were evenly spaced and weighted, not like an animal in a hurry, not like an animal that had any inkling of its mortality. That reptile’s line may have gone extinct, but somewhere nearby was a little critter that survived and became my ancestor. One hundred million years before that, dozens of large nautilus-like creatures died and sank to the bottom of an ocean. Tectonics had uplifted their final resting places almost three thousand feet in the sky. Although the nautiloids went extinct, the lines of their cephalopod cousins such as the cuttlefish, squid, and chambered nautilus—and those of my ancestors from this era—survived multiple mass extinctions and are still with us today. At Deer Creek Falls, we hiked past a fairytale-like waterfall and ventured back another 100 million years, into rocks showing the tracks of trilobites and worm burrows after the Cambrian Explosion. Even knowing that the trilobites were doomed in an upcoming extinction event, I couldn't help but feel joy at the recognition that here in these rocks were signs of life gaining a powerful foothold on the planet. Those early survivors would give rise to all that is living today. Those rocks, on which we hung our sarongs and placed our hats to dry, were half a billion years old! The fossils showed me how fragile and random life can be, the olivine reminded me of the power and heat beneath our feet, but the abundance of plants and animals along the river—cicadas, speckled dace minnows, red-spotted toads, Chuckwalla lizards, California condors, bighorn sheep—showed me that life really is resilient. Regardless of the financial, emotional, or physical difficulties that my students experience now, their DNA has survived all of the pitfalls of life on this tumultuous, unpredictable shard of land. We’re survivors, down to our genes. I'd like them to know how awe-inspiring that is, and I'd like, somehow, to encourage them to see the value of their lives and of those around them by studying the pathway of time that their ancestors journeyed. I cannot adequately thank the NCSE members on the trip who supported the teacher scholarships and who patiently (and repeatedly) answered my questions about geology, wildlife, plant life, chemistry, astronomy, and educational practices. I am extremely grateful to all of you. 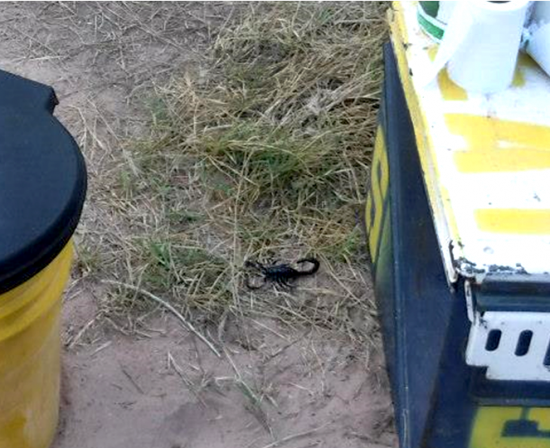 Many thanks, also, to geologist Steve Newton and mammalogist Josh Rosenau of the National Center for Science Education for their grace and good humor with me (even after I put a fake scorpion near the latrine and a plastic cockroach in the food bin). Meeting and learning from everyone on the trip was delightful.